JAWA, a legendary motorcycle brand born in Prague in the 1920s has come alive again in a spanking new avatar. The revival team - Classic Legends reached out to Elephant Design to help them create the ideal contemporary classic retail experience. For the brand, it was important to pay homage to inherited authenticity. For us, this had to be a story. A Jawa Story, told through a warm, cosy Book Café around which our central theme revolved. The store is minimal and frank. The customer’s first connect is with the rugged Jawa Door Handle in solid wood with embossed steel inlay. Independent zones were created to play out the central theme to retro modern bikers. 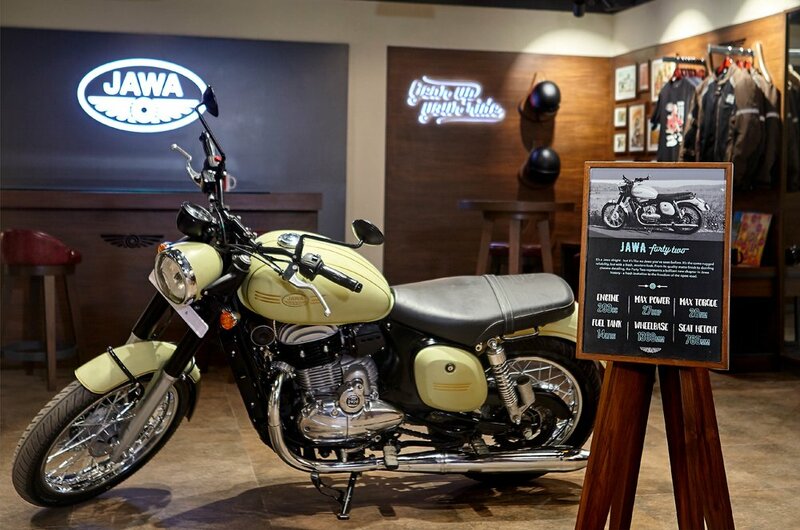 Jawa motorcycles are positioned upfront for quick browse & feel. An eclectic Book Café corner replete with curated 70s paperbacks and collectibles surrounds an ample community table, suited for informal biker interactions. 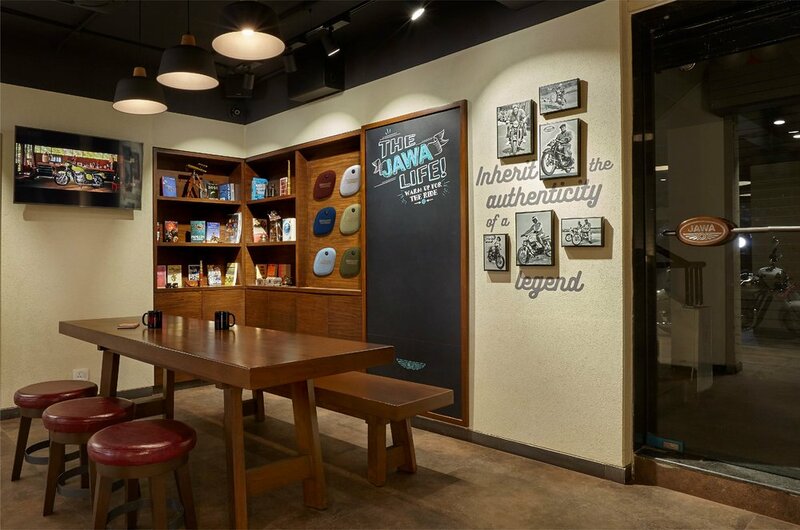 A conversational Jawa Life chalkboard, an authentic Legends’ wall with posters of epic Jawa heroes and Jawa side panel colour variant display, complete the themed ‘Book Café’ setting. A merchandise counter with focused brand wall backdrop doubles up as place to check out accessories or have a tête-à-tête with sales personnel. 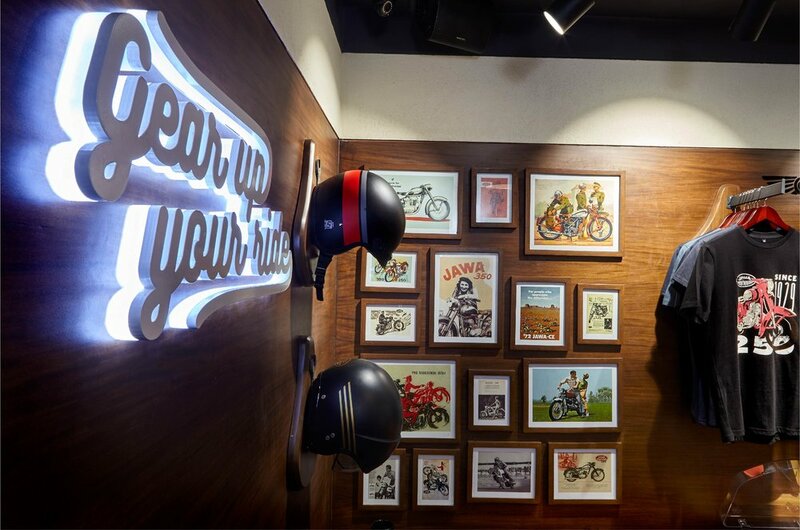 Jawa biking gear & accessories are displayed in the “Gear Up Your Ride” zone along with picture frames of charming old-world Jawa ads to create a nostalgic mood. Wooden Bobber seat profiles showcase helmets and jackets. Jawa red Chesterfield sofa adds to the relaxed vintage appeal. A low bookcase, poufy and distressed wall-mounted tin art, Jawa Clock and posters inspired by tinplate lithography, complement and complete the Classic lounge space. The Legacy wall is hand-painted by a local artist as an authentic tribute to the first Jawa motorcycle - JAWA 500 OHV. Information about Jawa lineage, product offerings etc. are accessible via the interactive touch screen. To unify the overall theme, the visual narrative flows through muted canvas printed lifestyle imagery created in modular format, for convenient adaptation to other locations. Simple dome and track lights enhance the motorcycle body colours and hi-gloss trimmings. Polished veneer and wood elements evoke honest warmth. Rough textured wall finishes serve as an ideal backdrop for all wall-mounted features. 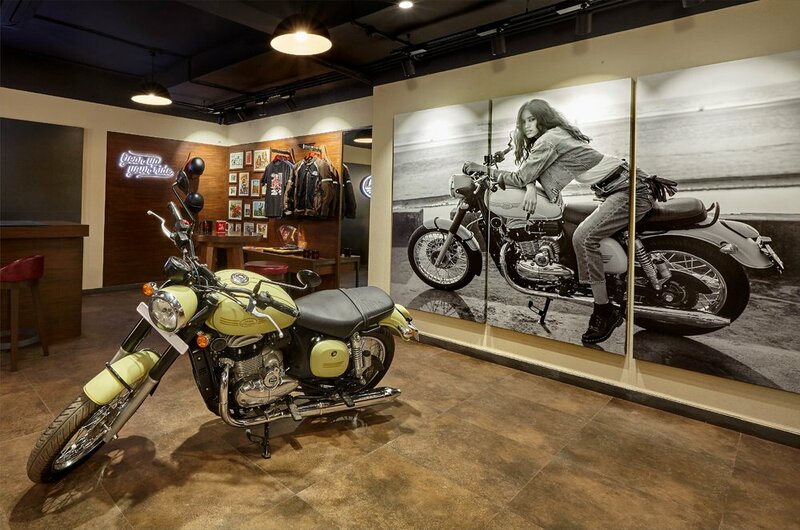 Flooring with warm, rustic feel and colour variation complements the rugged appeal of the bikes and brings in a quaint personality to the space. To the Jawa loyalist, it is a homecoming. To the modern rider, it’s a newfound legacy brimming with passion and pride, engineered for the new age. — Ashish Joshi, CEO, Classic Legends Pvt. Ltd.